In May 2006 the Watershed Center helped Inland Seas Education Association install a constructed wetland on their property to help treat and improve stormwater runoff. The Watershed Center was just one of a handful of partners who helped provide funding for Inland Seas Education Association to complete this project and see it to fruition. 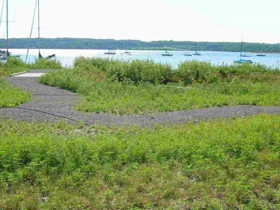 In 2004, Inland Seas Education Association began exploring solutions to the polluted runoff flowing across their parking lot into Grand Traverse Bay. The runoff originated from the streets of downtown Suttons Bay and a nearby gas station and was causing oil, gas, grease, and other pollutants to wash directly into the bay. Additionally, the runoff was causing gully erosion along the shoreline. What evolved was a plan to stabilize 200 feet of their shoreline using “soft” engineering and natural materials, and create a wetland located between the Inland Seas Education Association building and the bay to treat the stormwater runoff. The finished 0.5 acre, constructed wetland includes a grassed waterway and two wetland basins that will treat runoff from an approximate 2.3 acres of urbanized area in downtown Suttons Bay including commercial buildings, parking lots, roads and a gasoline retail station. Regular monitoring of pollution levels by Inland Seas’ professional staff and volunteers will be conducted quarterly. The area has already attracted a collection of wildlife including Canada geese, mallards, and many, many frogs! As part an ongoing project, Inland Seas Education Association will be developing a wetland/runoff treatment curriculum for the general public, riparian property owners, managers and students. This will include a self-guided walking tour with interpretive signs and a brochure. A more formal instructional program for students and professionals will be developed. We anticipate that the shoreline stabilization project will prevent approximately 3.2 tons of sediment, 2.7 lbs of Phosphorus, and 5.4 lbs of Nitrogen from entering Grand Traverse Bay annually. Additionally, the constructed wetland will prevent a further 1.01 tons, 1 lb Phosphorus, and 6 lb Nitrogen from annually entering the Bay via stormwater runoff.